Newsarama just posted a video interview with the one and only Tak Toyoshima. In it, Tak talks about the pressure involved in putting out his daily comic strip, Secret Asian Man, especially as newspapers are dying out left and right. Oh, and he plugs a little book called Secret Identities. I’ve heard good things about that. Since their vids aren’t embeddable, go here to check it out. And while you’re there, check out Newsarama’s NYCC interviews with other Secret Identities-affiliated creators Cliff Chiang and Greg Pak. First off, our very own Jimmy Aquino (“Sampler”) made it all the way from California to be with us in New York. 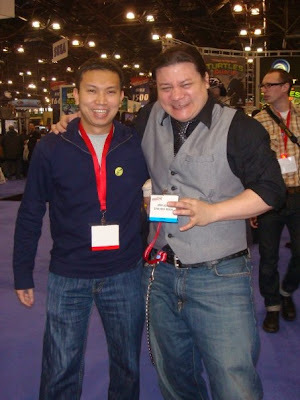 While there, he even met the other Jimmy Aquino, and, miraculously, the multiverse didn’t implode! We were fortunate enough to meet Mia from Ningin.com, and she had plenty of kind words to say post-panel. Don’t believe me? Well, Mia reiterates many of those kind words on her blog, too. Jonathan at Elmcitytree stopped by our panel on Saturday and gives some of his thoughts on it and where Asian Americans stand in the issue of race in America. Plus, he poses a very thought-provoking question that I actually wish he brought up at the panel! 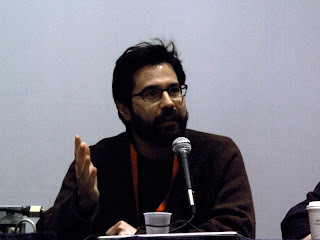 The blog New York City of Mike has a shot of Greg Pak from our panel on Saturday. Just scroll down. Greg’s right beneath the guy in the Wesley Dodds Sandman costume and right before Unemployed Skeletor. Another photo, for which you’ll have to get your scrolling on, features the whole SI crew (at least those of us who made it to the panel) and is available at Publisher’s Weekly Comics Week. If it looks familiar, it’s because it was taken at the same time as this one. Over at channelAPA, there’s a nice write-up about the book and panel, and they’ve embedded our trailer. But head over there to get another look at our favorite Asian American Superman. This time joined by the Asian American Wonder Woman! Finally, Chelsea over at Wednesday’s Child shared some of her thoughts about the Multicultural Mask panel moderated by Jeff Yang. Ladies and gentlemen, your Secret Identities crew! Back row l to r: Anne Ishii (panel moderator), Jimmy Aquino (writer, “Sampler”), Greg Pak (writer, “The Citizen”), Ken Wong (writer, “Justified”), Jonathan Tsuei (writer, “9066”), Tak Toyoshima (writer/artist, “S.A.M. Meets Larry Hama”), Bernard Chang (artist, “The Citizen”), Larry Hama (Legendary). Front row l to r: Keith Chow (Editor-at-Large), Jeff Yang (Editor-in-Chief), Sarah Sapang (artist, “16 Miles”), Jef Castro (artist, “Peril”), Alexander Tarampi (artist, “Gaman”). This pic, taken ten minutes before the panel started, doesn’t do the audience turnout justice. Once we got started, there wasn’t an empty seat (or empty spot on the back wall) in the room! Kickin’ it at the Epic Props booth. Larry Hama and Tak Toyoshima wanted to reenact a scene from “S.A.M. Meets Larry Hama,” but the lovely Kang Suh waitress was pouring everyone glasses of OB and soju; so obviously, our priorities were elsewhere. “Kampai!” Left to right: Larry Hama, Tak Toyoshima, Cliff Chiang, Jenny Lee, Jeff Yang, and Keith Chow. Yes, we’re posing in front of a giant acupuncture and herbs billboard. Here’s the exclusive NYCC trailer for Secret Identities that debuted during our panel on Saturday. Now with audio! With NYCC only only two days away, here’s an update on where you can find Secret Identities this weekend! Finally, make sure you visit Art Director Jerry Ma (and buy a t-shirt or two) at the Epic Proportions booth #1908! Happy New Year everyone! Now that it’s 2009, let the Secret Identities hype commence. The fine folks at New York Comic Con have just announced the majority of their panels at this year’s con. And guess who got invited to the party. For those of you planning to attend NYCC, make sure you’re there on Saturday, February 7 at 1:30PM, and make sure you stop by Room 1A18 to check out a panel called ASIAN AMERICANS & SUPER HEROES: SECRET IDENTITIES featuring the fine editors and contributors to the groundbreaking anthology. And if you stick around through the weekend, Secret Identities Editor-in-Chief Jeff Yang will be moderating a panel called THE MULTICULTURAL MASK on Sunday, February 8 at 11:15AM in Room 1A17. This panel will bring together creators who stand out as pioneers of the new inclusiveness in comics to talk about what works, what doesn’t, and why it matters — from both a cultural and economic perspective.